Mr. Mercedes is an American 60 minute scripted thriller television series, which kicked off on August 9, 2017, on Audience Network and is broadcast every Wednesday at 22:00. The show is currently in its 2nd season. Audience Network has officially confirmed the renewal of Mr. Mercedes for Season 3. The exact release date is yet to be announced so far. Sign up to track it down. 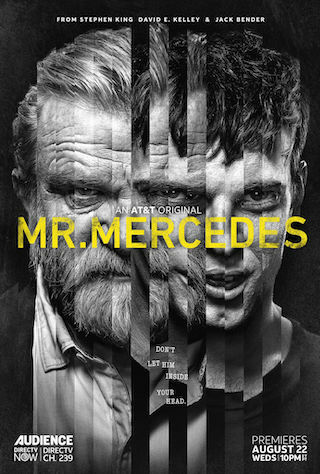 In Mr. Mercedes, a demented serial killer taunts a retired police detective with a series of lurid letters and emails, forcing the ex-cop to undertake a private, and potentially felonious, crusade to bring the killer to justice before he can strike again. Based on the bestselling novel by Stephen King. The 2nd season of "Mr. Mercedes" took place a year after Brady Hartsfield's thwarted attempt to perpetrate a second mass murder in the community of Bridgton, Ohio. Since the incident, Hartsfield had been hospitalized in a vegetative state. Retired Detective Bill Hodges did his best to move on from his Brady obsession, teaming up with Holly Gibney to open Finders Keepers, a private investigative agency. But when unexplainable occurrences began to affect hospital staff members attending to Brady, Hodges was haunted by the feeling that Brady was somehow responsible. Nov. 19 2018 - Following the dramatic finale of season 2 of "Mr. Mercedes," AT&T AUDIENCE Network has picked up this critically acclaimed drama for a 3rd season. Production for the 10 1-hour episodes is scheduled to begin in early 2019 in Charleston, South Carolina with the premiere launching later in the year. "Mr. Mercedes has resonated with such a wide audience, so we're thrilled to bring it back for a third season for our customers," said Daniel York, senior executive vice president and chief content officer for AT&T. Mr. Mercedes is the kind of show every fan of the thriller genre must see. In my opinion, such a series couldn't appear on ABC, NBC or CBS. Audience Network owned by AT&T started to spread quality video content, including other television hits such as ICE and Condor. Of course, Mr. Mercedes owes its success to the genius of Stephen King. But nevertheless, the adaptation turned excellent. The ending of Season 2 was gripping and unexpected. However, I suppose those who read the books knew about it. Brendan Gleeson deserves Oscar for his role of Bill Hodges. I think the guys who organized casting made a bet to the right horse. Without a doubt, Harry Treadaway, who played Brady Hartsfield worth praise. But my feelings about this character are ambivalent. On the one hand, he is a 100% sociopath, on the other -- he is a mastermind. He is tricky and ruthless. Of course, even upon his returning from a coma, Brady realized what he was doing. Mr. Mercedes also distinguished thanks to a galaxy of supplemental characters, including even a turtle, Hodges' pet. Mr. Mercedes is not only a classic cat-and-mouse game between a serial killer and a cop. This is not about who eventually managed to win. It's all about the life and its circumstances. Of course, I neither defend the serial killer nor encourage his genius. For me, it was interesting what events forced his mind to do what he eventually did. Without a doubt, Mr. Mercedes deserves Season 3. I support the decision of AT&T's Audience Network to pick up the show for another installment. We thereby soon will be witnessing another gripping thriller. But the key idea of my review is that I want to see more quality shows on cable TV. There are lots of them that deserve proper attention. I doubt something like this might appear on the national television. Mr. Mercedes, Condor, ICE, are the shows that forced me to pay attention to Audience Network. By the way, Crackle also spread quality content. StartUp worth your attention as well.